You just finished your last season, you’re putting on that cap and gown you’ve been waiting years to wear, and you might even be leaving your home and FIRST team. Whether you’re moving on to college or the work force, your time as a member of the FIRST community doesn’t necessarily have to end. After spending a year making the transition from student to mentor/volunteer, here are some tips I have for those of you graduating this year. 1: Don’t be afraid to try new things. Many people give the advice that everyone should take off a year from FRC after graduating, and take a year to try new things. While I don’t necessarily agree with having to leave FRC, it isn’t a bad idea to try some other hobbies or activities. 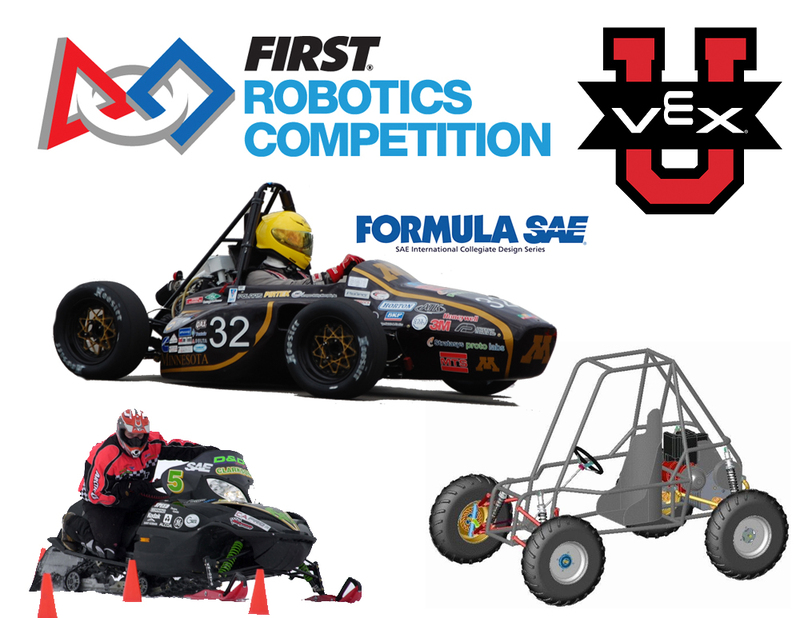 Many schools have engineering teams such as Baja, Formula SAE, Snowmobiles, VEXU, and many others. If you’re going to college, there will be lots of opportunities to join new communities and groups. It’s also important to have a social life and become a well rounded person in your years as a young adult. Above all else, make sure you’re putting your life ahead of robots. Your grades and jobs are far more important, and FIRST will be there later if you decide to take some time off. 2: The program isn’t about you. One of the most difficult things for younger mentors to grasp (myself included) is why they are becoming a FIRST mentor. It’s important to realize that becoming a mentor can’t just be a continuation of your time as a student. The program is for the students and your job as a mentor is to help them get the most out of the program that they can get. The easiest way to make sure you’re doing the right thing is to think about your mentors from high school and what they did to inspire you and make you want to be on the team. If you plan on becoming a volunteer, think about the best volunteers that you worked with from your time as a student, and figure out why they were a good volunteer. Above all else, make sure you create a pleasant experience for the students and teams around you. 3: It’s okay to keep learning. One of the most jarring things about the transition from student to mentor is that you go from being the one asking questions to being someone expected to know the answers to them. It’s okay to admit to yourself and your students that you may not know the answers to all of their questions, but it’s important that you continue to learn everything you can to help yourself and your team. Becoming a mentor or volunteer may feel like you’re starting all over again because you realize how much you don’t know yet, but if you take the time to learn from others you will be fine. On any team there will be more experienced mentors that you can learn from, and you can use that knowledge to teach it yourself. 4: Get to know the FIRST community around you. Since many high school graduates move a decent distance away from home for college, you may be entering a very different FIRST community. Get to know the teams around you, especially if your school or job is connected to a FIRST team in the area. Some schools sponsor teams and have many college mentors (Clarkson, WPI and Northeastern are a few examples). If you’re more interested in volunteering, get to know your local regional directors and key volunteers, and ask how you can get involved. If you show lots of interest and work hard, you can get into the volunteer role that you want a lot easier over time. Seriously, don’t just become a FIRST mentor or volunteer because that’s what you see other alumni doing. You need to enjoy your new role where you aren’t the focus anymore. As a mentor, your main job should be to help kids learn and grow as people. There are plenty of other opportunities out there if you want to build or program things like you did in high school. Mentoring and volunteering can be extremely rewarding if you enjoy helping other people learn, but not as much if you just want to keep building robots. Whatever you decide to do after graduation, make sure you enjoy it to the best of your ability. I hope these tips help you realize why or why not you should continue on with FIRST after high school. It’s not for everyone, but it can also be even more rewarding than your time as a student. My new favorite FIRST memory was having some of my students come up and thank me for being their mentor after their season ended, as well as students from other teams coming up to me and thanking me for volunteering at other events. I hope your future adventures can be just as rewarding, because FIRST can still be an amazing part of your life.